With the Barclays Center and Manhattan Center each hosting part of the show, Raw's loaded 25th anniversary episode took place in New York City on Monday night. Nostalgia was the theme for the episode, along with some build to the Royal Rumble. 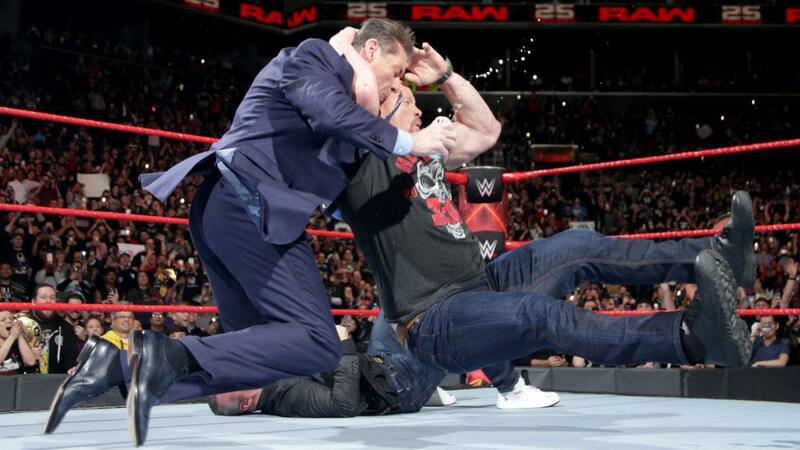 Steve Austin returned to WWE television and dished out stunners to Vince and Shane McMahon, The Undertaker cut a promo where he didn't reveal much about his in-ring future, and DX and Scott Hall endorsed The Balor Club. Chris Jericho also appeared and put Elias on his List. And Trish Stratus, The Bellas, and more former members of the women's division were introduced to the crowd. The Miz won the Intercontinental Championship from Roman Reigns, an eight-woman tag match continued the build to the women's Royal Rumble, and Braun Strowman stood tall heading into Sunday.